As Joni Mitchell rose to the height of her fame, she was emblematic of the singer/songwriter era. She made her first significant income as a musician when others recorded her early compositions, most famously Judy Collins, and when Mitchell began her own recording career, she did not cover a composition other than her own until her sixth album, and rarely throughout her career. That suited Joni, a prodigious artist, and it also defined the time, when every recording artist aspired to release an album of completely original music every year or two. Covering others' songs was a rarer occurrence; there was less expectation that there would be a canon of great rock songs and no parallel to the Songbook of American Standards so beloved of pre-rock interpreters. Joni has herself been dismissive of the pre-rock songs, describing them as too simple, melodically and lyrically. Interpretation of others' work has very infrequently interested her. And Joni Mitchell was herself, despite the phenomenal vocal instrument, not a great singing actress (which I submit would be a required skill to be an interesting interpreter), especially in her early albums. That's why it is so thrilling to see great cabaret and musical theater artists pick up her music. 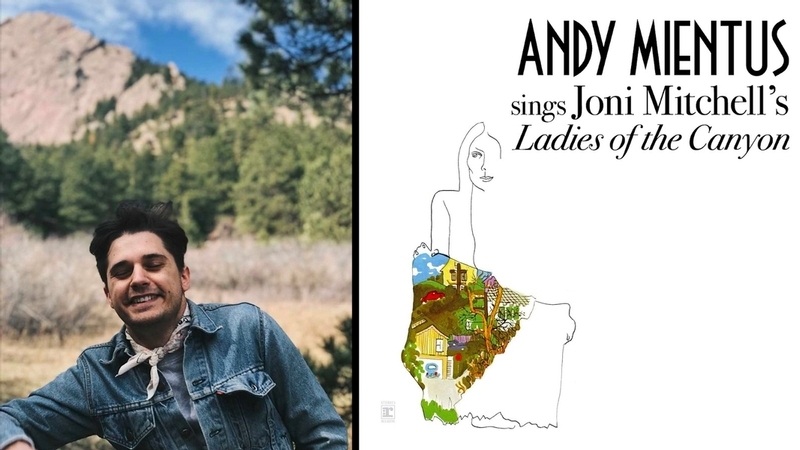 Andy Mientus, performing Joni's 1970 album "Ladies of the Canyon", was superlative proof of concept. It is also incredibly exciting to see Joni's songs, perceptively likened (by performance artist John Kelly) to 19th century German Lieder, joining a new canon. Mientus, whose performance of Jeff Buckley's "The Last Goodbye" near the end of Season 2 of the TV series "Smash" was one of the best moments of that brilliant, frustrating mess, brought great strengths to the evening. He was a charming host, setting the scene for the first song by gently mocking hippie tropes, and then easing into Morning Morgantown. From the beginning, his clear, unaffected tenor suited her songs, while his training as an actor allowed him to communicate nuances to the lyrics I've never before appreciated. This was especially true in the second and third songs, "For Free" and "Conversation", two of my favorite songs from the album. The arrangements for the evening were by Benjamin Rauhala, who played piano throughout. They mostly stayed close to the album, with subtle exceptions. The piano in "For Free" was sparser than the original, which suited Mientus' somewhat matter-of-fact theatrical presentation of the lyric. Those choices combined to make the poignancy of the street musician, playing so beautifully to general indifference, deeply moving. "She removes him, like a ring, to wash her hands. She only brings him out to show her friends"
When he belted "I want to free him", I believed him. Mientus' skill as an actor really made these songs distinct and clear. He has a beautiful if unflashy instrument. He moved extremely easily between registers, with high notes that were never hooted or even truly falsetto-y. But it was the emotional viewpoint that he took for each song that made this show so satisfying. Mientus brought out his first guest, Kelli Barrett, for Ladies of the Canyon and invited his fine back-up singers Krystina Alabado and Krista Pioppi forward. The ladies took the first three verses and Mientus the fourth. Interestingly, for the doo-doo-doo's that end each verse, the harmonies accumulated: Barrett sang only one vocal line to end the first verse, then the next singer added another line, and by the end of the song the four voices intertwined to glorious effect. Ladies of the Canyon is an odd album in Joni's progression, collecting songs she had written much earlier but hadn't yet recorded along with her most recent compositions at the time. I find the second side weaker than the first: three somewhat diffuse songs followed by three songs that became overexposed over the course of her career. Side 2 opens with Rainy Night House, in this performance fairly significantly altered from the album version. The piano-based song was instead anchored by driving, rhythmic guitar (Justin Goldner, who was terrific all evening). I thought it was a great improvement. Mientus' version of Big Yellow Taxi was more accusatory than Joni's version, with even a slight lyric change: "You paved paradise" instead of "they". He sang the last verse a capella, a beautiful moment. For Woodstock, Kelli Barrett returned, and then all of the Ladies of the Canyon lead a club-wide singalong on The Circle Game. For an encore, Mientus brought his husband, theater director Michael Arden, on stage. Arden sang Joni's classic "thoroughly depressing" Christmas song, River. Arden's voice is fuller, especially in the lower range, and his vocal style is more expressive (even slightly operatic) than Mientus'. Still it was very satisfying, especially his long high belt on "Fly Away". The evening closed with Arden and Mientus singing A Case of You (one of Joni's greatest and most-covered songs) as a duet. Mientus amusingly commented that they never sing together around the house, mostly talking about the cat. They sang verses alone, they traded lines, and sang the final part of the song together, their vocal styles moving closer to each other. Lovely. This article has been viewed 1,048 times since being added on December 5, 2018.